Any home converted to a NextEnergy system from oil or electric resistance will cut about 75% off its yearly heating and cooling costs. If propane heating is replaced with a NextEnergy system, the savings are even better, at approximately 80%. 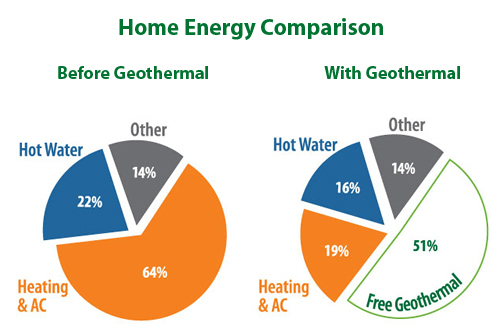 Using geothermal for heating and cooling changes the way you pay for energy. Because you are taking advantage of the natural heating (or cooling) capacity of the earth, on property you own, you are drawing upon a new resource that is essentially free. Geothermal for the home has tremendous potential to reduce carbon emissions and significantly reduce our impact on global warming. A geothermal system installed in an average-sized home, replacing a traditional energy source, reduces fossil fuel emissions by the equivalent of taking two cars off the road, or planting an acre of trees. We live in a time of diminishing natural resources. Most recently we have seen the impact on fossil fuels such as oil, where demand now outstrips supply. Not only does this force prices to rise sharply, it takes its toll on the environment, every day. Clean, renewable NextEnergy geothermal systems make use of the energy of the sun, stored in the ground, to heat and cool your home or business. This energy is limitless, easy to access, and always available. It is also totally non-polluting. An added benefit of geothermal for the home is that the system effortlessly maintains a steady ambient room temperature. The difference is simple: conventional systems rely on high-heat sources such as combustion and this means heat is delivered in bursts to satisfy your thermostat. With geothermal, a lower temperature heat source is constantly providing heat. Fewer bursts. Reduced noise. More comfort. Similarly, with a forced air system, by removing the source of combustion less dry air is required for burning. Less dry air. Again, more comfort. In uncertain times, self-reliance is always practical. And above all, geothermal is a practical solution based on a simple principle. You own your land, and the earth has latent heating and cooling capacity. A geothermal system simply taps into that resource, one that you already own. Freedom from the oil delivery truck, the propane fill up or the natural gas bill is now possible. The only energy required is electricity for the geothermal unit. The advantage is control over your energy future. That means less worry, knowing that the price of "free" geothermal energy will never increase.